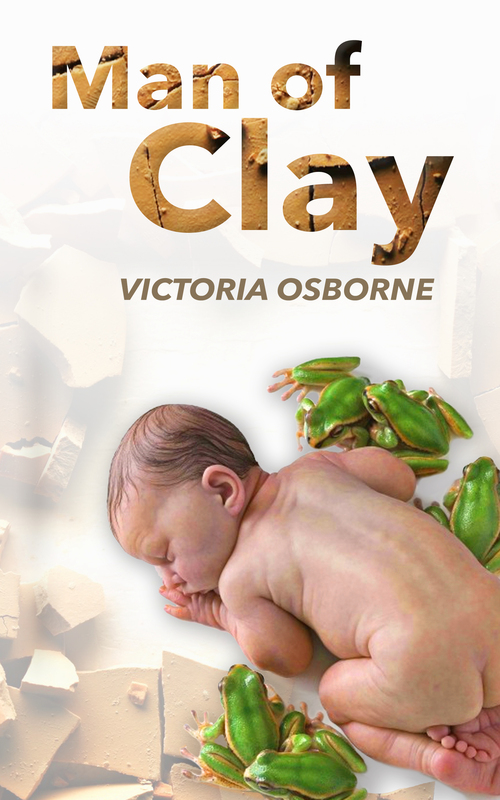 If you would like a free print copy of Man of Clay then head to Goodreads at the end of February! Giveaway ends March 31, 2016. I COULD NOT PASS THIS UP!! 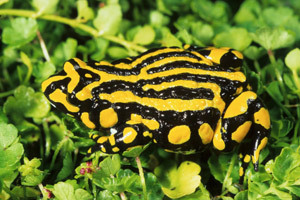 A Southern Corroboree Frog! Rob! Not sure if you can read the sign? It encourages by-passers to kiss and or hug the large stuffed frog for the chance to donate money. Who would not want to kiss this gorgeous creature? Here are the organisers and I was remiss in that I did not find out their names. I’m very sorry for they were devoted to their task. They told me they had raised over a hundred dollars! That’s pretty good going for 50 cents a pop. The frog is somewhat bigger than the real creature but that’s okay. Look at their cheery faces!! Couple of things about this quote. The uncertainty of science is a language matter. For Tim Flannery to talk about an ‘even chance’ does not mean there’s much debate about it at all. In fact, according to my research, the fact that chitrid spread so quickly is not only due to a feral species being introduced to waterways – probably a frog commonly used for human pregnancy testing – but also the conditions were nice and warm for the fungus to grow. So, we can trace frog disappearances back to humans which ever road we choose. 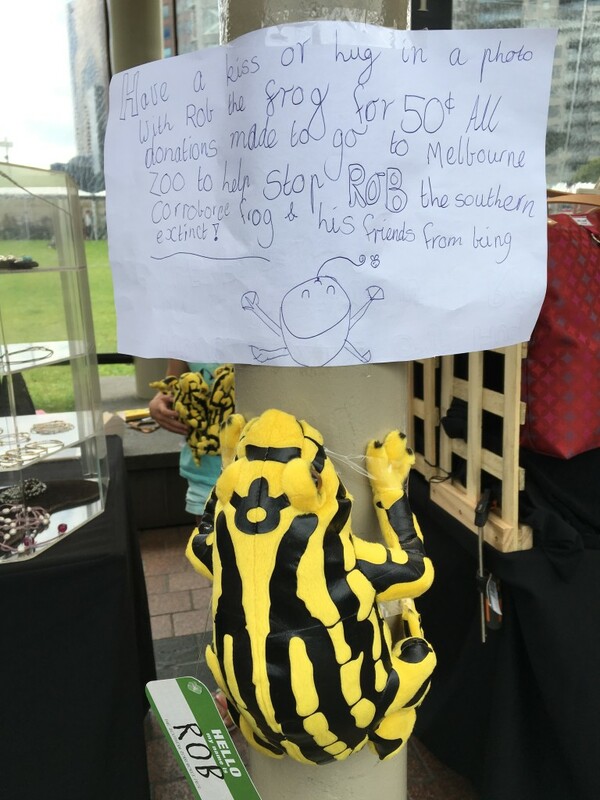 Of course, for the corroboree frog, it’s climate change that will get the survivors now. They are mountaineers, nestling into spagnum moss, needing snow and ice for their lifecycle to keep spinning. A few of them have gone because of ski resorts but that whole global warming thing, well, doesn’t bear thinking about it, does it. —Gidday, Bashy boy, came a deep, greasy voice from the dim low shadows of the tunnel—Long way from home, aren’t you? All alone in the dark, poor little creature… It was Spill, the diamond python. Spill was large for his size and Bash stared into his glittering eyes as though he’d been pinned to the ground. Bash wasn’t scared of many things but pythons were up there with the most scary things of all. Well up there. Pythons were never conducive to a frog’s feeling of good health, especially when that frog had recently been staring into a dark pit of despair. Suddenly Bash’s pit seemed very deep and very dark and there was absolutely no way out—Hi, Spill, didn’t see you there, in the dark… How have you been? How’s the family? Busy? —Not as busy as you, Bash, from all accounts. I hear you’ve been very busy, Bashy boy. You’ve been up to some particularly interesting dealings, young Mr Frog, haven’t you, hmmmmm? —Hey, froggie, the walls have ears around here. You should know that. Just happened to be passing. Fascinating the titbits that fall in one’s path, ain’t it. —The things you learn, continued Spill—Makes you think, don’t it. Makes me think; that’s for sure, about all sorts of things; like, you. I’ve been thinking about you, Bash, ol’Basheola, Bashy boy; do you think you deserve to live? Or would you say I deserve a snack? A little Bashy-nashy snack? Who is to say what might have happened if, suddenly, like super heroes, Torque and Spark had not flown down the tunnel towards Bash and Spill at that very moment with Bash stuck, hard and squealing, in Spill’s hypnotising eye beam. —Hi-ya there, Bash, all right, then? said Torque cheerfully—Evening, Spill. How’s it hanging? —Come to see you home, Bash, said Spark—Need a lift? Without waiting for discussion, Torque and Spark flew down to either side of the little frog and lifted an arm of black and yellow each. 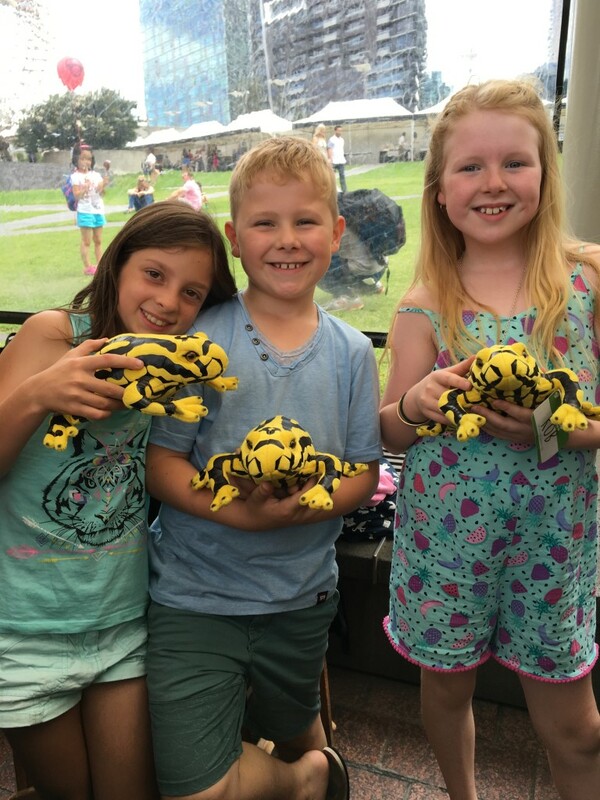 They flapped their flight wings as hard as they could and, before the amphibian had any idea of what was happening, got purchase and winged that little black-and-yellow corroboree frog out of there as fast as they could carry him. Spill slid round and watched the bizarre trio fly erratically down the hallway. He sneered and had a quiet little chuckle deep down in his long scaly throat before moving quietly on his way. Cli-Fi at the Wheelers Centre last night – that’s right Climate Change Fiction. Cli-Fi. 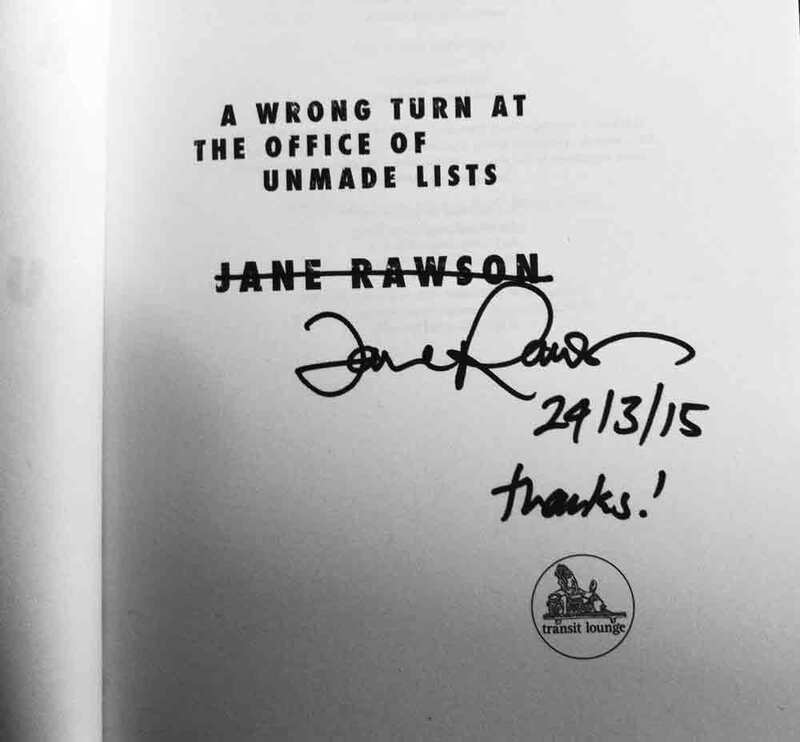 A full house of well-behaved Melbournians tucked into the Wheeler’s Centre welcomed Jane Rawson, author of A wrong turn at the office of unmade lists, Alice Robinson, author of Anchor Point and James Bradley, author of Clade. Mr Birch remarked that all three novels were about the interactions between people, whatever the circumstances in their lives and added all the books displayed great storytelling featuring strong and engaging characters. The audience was amused by Mr Birch’s comments regarding surprises in Clade such as Bruce Springsteen’s apparent prescience with titles such as Thunder Road and Darkness on the edge of town and; the Australian Rules football team ‘Carltonwood’ resulting from a blend of two currently strong clubs. Thus warmed up, Birch commented asked the writers if it matters, what writers write about? Does their work make an impact? Did they expect or want their work to affect readers? Jane began A wrong turn by just wanting to write a story but by the edit stage she really did want to make readers think about climate. She’s learned that as a result of her book, people do experience concerns when the days are getting hotter. Alice began from the issue and had to construct story and characters to fit the cause. Essentially her book became a family story as climate is a family issue. James stated the bar was too high for writers to imagine they could change the world. Perhaps the opening chapters of Silent Spring or Neuromancer might have succeeded but there are not many books that actually altered the way people thought. Climate change happens on such a scale that people might be able to engage intellectually but not meaningfully. He feels that writers are more like weather vanes, picking up on what is around them rather than making real change. Tony thought these writers might be underestimating their knock-on effect and they should be pleased as they don’t know what effect their books might have. He went on to ask about time. The books are about people, memory functions and time. He pointed out each writer is interested in how we remember. Alice spoke about her driving concerns. To think about the future means we must think about how we got here. To look back into the past means the story of settlement and the history of the land before Europeans. What are we going to do now? How do we live now? 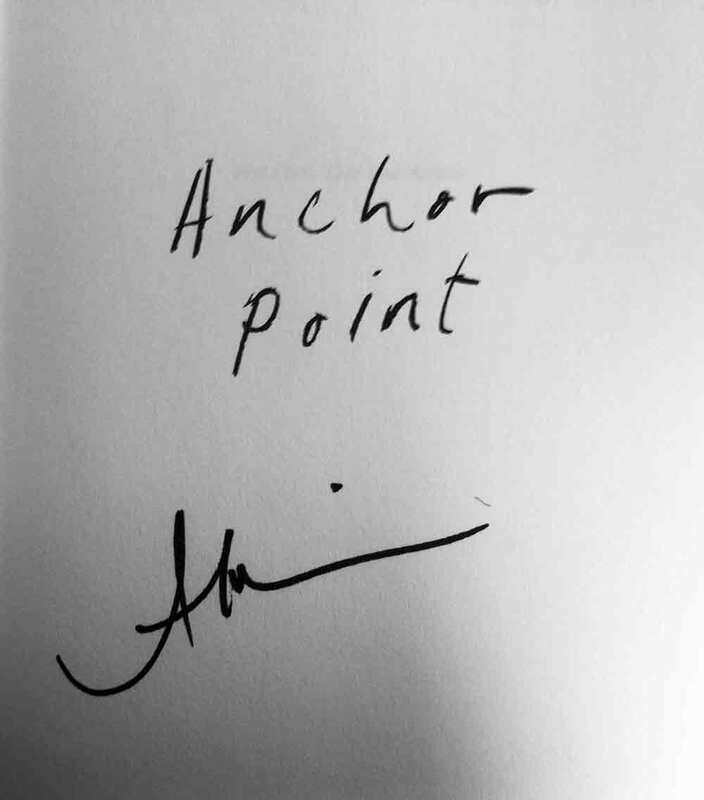 James felt remarkable connections with Anchor Point. There were similar motifs – particularly around time – in Clade. Jane has a time traveller called Ray in A wrong turn, who happens to be Aboriginal. Tony congratulated her on this creation and also commented on her theme of homelessness and compared an essay he had written about the subject. 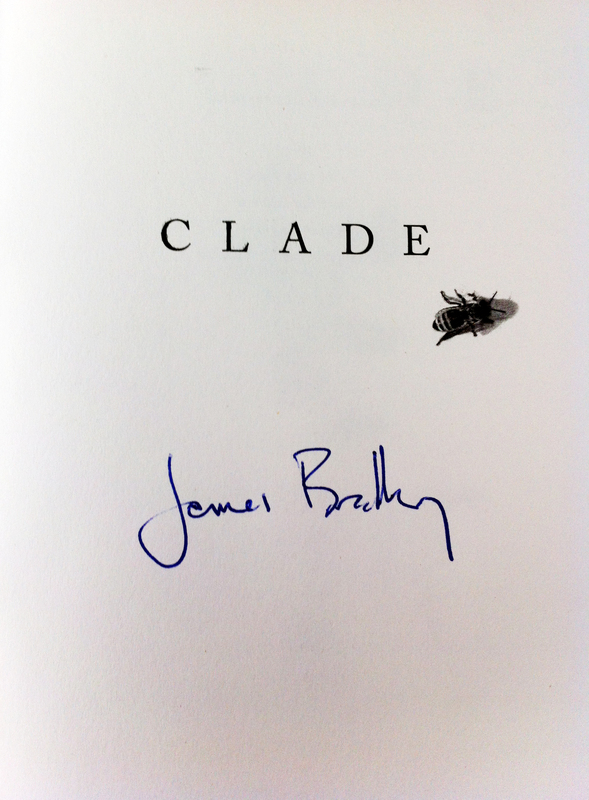 James drew heavily on science for Clade. As he began to write scientists were warning about the dangers of methane burps in the frozen tundra. As he edited, the craters came to public attention. As he wrote, he invented an idea about the planet’s shifting axis which, of course, has now become observable. All the writers agreed that it was indeed unsettling to see their writing bed down in actual events. But that is the nature of climate change. Scientists predict and then we see their predictions come true. It was when Tony Birch commented about our relationship to nature I began to really feel part of this community! He asked the writers how they conceived of nature? James remarks the power of nature can’t be denied. In his book, in the north of England around Norfolk, the Fens were created to keep the ocean at bay. Now ‘the sea is returning’. The sea will not be denied. Laura, in Alice’s book, wants the land to return to what it was. Alice believes we must succumb to nature. James says he didn’t want the land to mirror people’s traumas. He wanted to create a book saying on some level that the planet doesn’t care. He wanted to get away from the common anthropocentric view of the world. He commented that the line between the virtual and the real is becoming less clear. The same technology that can pry into nests and follow birds on migration, showing the world’s amazing natural life, can do nothing to stem the force causing the extinction of those very creatures. 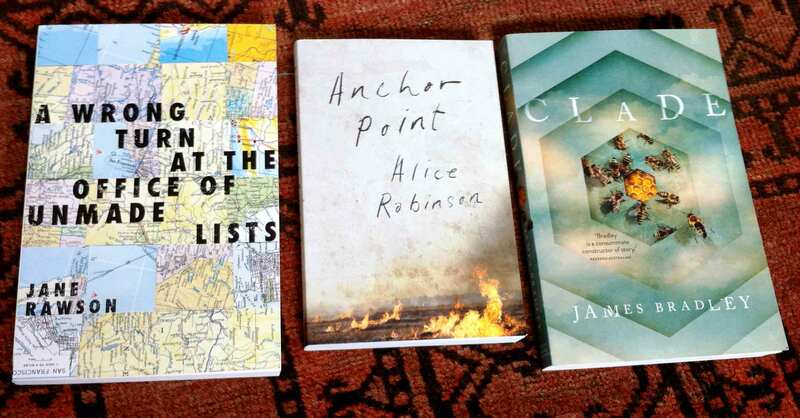 Alice remarks the books all have positive points; James’s landscape is beautiful and Jane’s book is funny. Jane said that we are born into the world we’re born into. People in the future will have to deal with what lies in front of them. Alice said that people’s lives are so busy with their everyday children and dishes that trying to deal with the big issues while real life is so involving. Tony highlighted a quote from Clade that ‘normality keeps fighting its way in’. James felt that was more about grief than the everyday life lived facing climate change but he believes that people are smart, that we will not turn this planet into Venus. Of course he recognises there are massively entrenched interests protecting their power and money. He believes we are having the wrong conversations. It’s not about whether politicians believe in climate change but whether we can recognise who is being used as a shill for powerful corporations. Jane commented that learning about the terrors of climate change can incapacitate a person but not acting … is just STUPID. Alice really cares about climate change – it took her seven years to write the book plus have two babies. On the one hand things she felt things going terribly wrong with the planet and on the other she made an enormous investment in the future by having children. That’s galvanizing for her – she had to do something. James also wrote his book because he’s got small children and he noted that most people are now alienated from the decision-making process. Australia is no longer run for the benefit of the many, particularly obvious after the debacle of the mining tax. Tony wrapped up the discussion by bringing it back to the writers’ power to energise activists. He thinks they can nudge the reader and produce ideas that Tony, for one, can recycle out into the world. The first question from the audience was about books around a dystopian future implying a moral judgement on those that came before. Jane said after the discovery that the majority of emissions causing climate change came in her own lifetime she can only blame herself. Alice agreed the blame can only be placed in the present. She thinks of what the children will have to carry into the future. James thinks the world is always ending for writers. Apocalyptic fiction is a way to wrestle with big ideas such as nuclear war in the eighties and terrorism ten years ago. Dystopian fiction tries to make great concerns and worries manageable. He added that worrying about morality makes him itchy. The next question was about artists’ obligation to take climate change seriously. Jane agreed that for her climate change was the most compelling issue for nature and other species. She can understand that others have different priorities but says that writers shouldn’t cut themselves out of the world of politics. Alice is deeply ambivalent. She wishes she didn’t have to care about climate change but once engaged she feels a responsiblity to try to show that each individual and their children will be affected. James thinks that writing is a political act but is wary of saying to any writer, you should write about this or that. He doesn’t think artists have a political obligation. Tony wrapped up proceedings by admiring the humility of these three writers. As far as Mr Birch is concerned they will all influence his thinking about climate change. 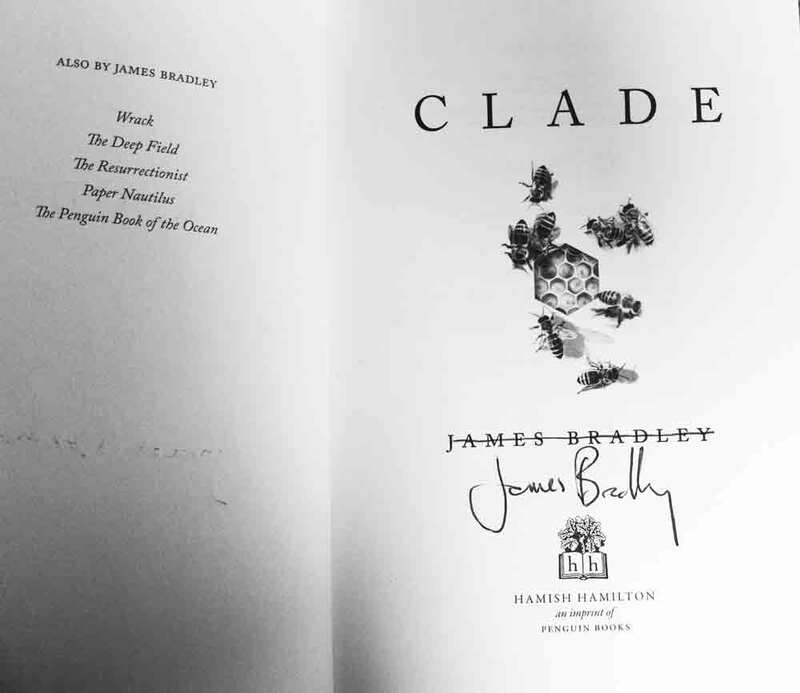 You’ll be interested to see James Bradley signed his book twice. The first time, emulated by Jane Rawson, he calls the American way. Lined and signed. When asked why he crossed out his name, he did not know. So that’s why he signed again in the clear space of the title page. It was the first time I’ve really been inspired by a group of writers. They were on my wavelength! I wish them great success and hope they do manage to nudge a few readers as Mr Birch suggested. They could even take the time to read my book, Man of Clay, and see the themes of time, change and heat repeated therein! My adult novel is available on Amazon! The featured sculpture is called ‘Small Things’ and it’s by Sam Jinks. The cover design was put together by Risa from Paperdino.